By an 81-18 margin, the Senate approved a stop-gap spending bill to keep government open until February 8th. The key to the vote was a deal to allow Senate debate on immigration reform and the DACA program. Yes, the Democrats blinked first and agreed to turn the government’s lights back on with only a verbal commitment that they could try to hammer out a deal for Dreamers in the coming weeks. A verbal commitment from Mitch McConnell? Seriously? The same Mitch McConnell who presided over a shutdown of the federal government for more than two weeks in October 2013 when Obama’s was President? The same Mitch McConnell who said, “The single most important thing we want to achieve is for President Obama to be a one-term president”? The same Mitch McConnell who said, “One of my proudest moments was when I told Obama, “You will not fill this Supreme Court vacancy’”? A verbal commitment from the turtle-necked, hypocritical, despicable, obstructionist Senate Majority Leader Mitch McConnell? What? The Senate Democrats are nothing but a bunch of pussies. It’s pretty clear that McConnell and the Republicans in Congress have grabbed the Democrats by their pussies. Senate Majority Leader Mitch McConnell announced plans today for a vote at 1 a.m. this Monday on a bill to fund the government through Feb. 8th. The move is designed to force Democrats to either agree to reopen the government without concessions on immigration and other issues, or to vote again for a government shutdown, which Republicans believe will hurt Democrats. This partisan strategy was concocted by Donald Trump and McConnell, who have been talking by phone throughout the day today. Trump and McConnell, along with House Speaker Paul Ryan, have struck a defiant tone, refusing to consider any of the Democratic demands on immigration or other issues until there is a “bipartisan agreement” to reopen the federal government. So basically, for Trump and the GOP leadership, it’s all about politics. Screw the nine million CHIP kids who need healthcare. Screw the 800,000 DACA DREAMers whose lives are in a constant state of flux. 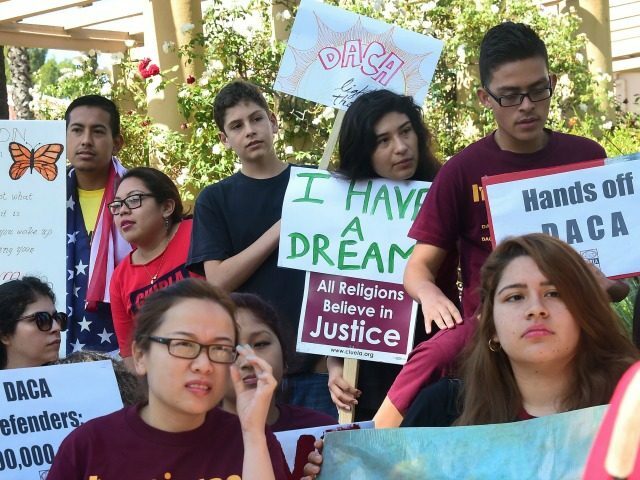 DACA, the Deferred Action for Childhood Arrivals (DACA) program that protects nearly 800,000 young, undocumented immigrants (aka, “Dreamers”) from deportation, was created in 2012 by the Obama administration after several failed attempts in Congress to pass a law to protect these undocumented immigrants. The latest reports are that Donald Trump is going to announce tomorrow that he is ending the controversial program. However, he is allegedly going to give Congress six months to craft a bill to replace DACA. What I’m about to say is rumor, but it comes from some usually reliable sources. Are you ready? Trump wants to tie the continuation of DACA to Congress approving funding for his infamous southern border wall. Yes, you heard that right. Trump may be using his wonderful, beautiful wall…you know, the one that Mexico was supposed to pay for…as a bargaining chip. Apparently he is willing to trade the futures of 800,000 dreamers for money to pay for his unnecessary and ill-conceived border wall. Again, this is an unsubstantiated rumor, but it doesn’t sound that far-fetched to me, based upon Trump’s campaign promises and his nature. Of course, with today’s headlines about North Korea, DACA and the border wall may be the least of our problems.